We had an outstanding time! My wife and I have just returned to the UK from our second visit to Hale O Ho’okipa. We had an outstanding time! Dave met us at the villa when we arrived to show us around and gave us some really great suggestions on places to eat and what had changed from our previous visit a couple of years back. We very much enjoyed talking with him and getting to know him a little. He is a great guy and will take care of anything you may need. Mahalo Dave! I highly recommend this villa and I feel sure any other that Dave manages would deliver the same quality and amazing overall experience. We had a wonderful stay in this Golf Villa. Everything is first class, down to the dishes and glassware. We have stayed in this unit before and appreciate the owner’s attention to detail. Unfortunately, we had some noisy neighbors in the building next to us and their voices carried every time they went outside. But we still enjoyed our stay. The plants on the deck really make this villa stand out. And we really appreciated, Dave, the property manager coming on a Sunday to reset our safe. We will certainly return. 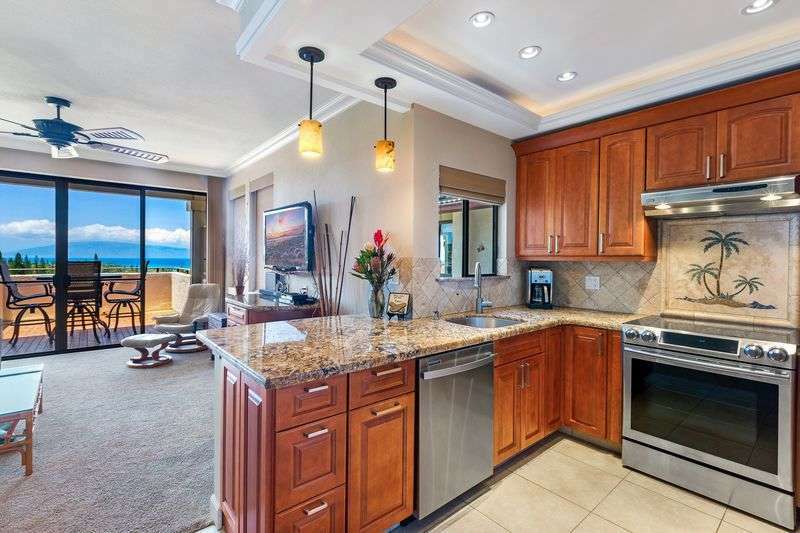 Very well appointed condo in Kapalua Villas close to the beach with a killer view. Beautiful condo just up from the beach in Kapalua Villas. Downside, far away from most restaurants and attractions. If golf and peace are your goal then this is the place. One of the best 950 sq ft of real estate on Maui. Well appointed and comfortable with great views. We feel fortunate to have chosen Hale O Kapalua to celebrate our anniversary. Dave made our vacation more enjoyable from our arrival and throughout our time on Maui. My wife and I summarized our stay at this villa and personally named it, “Maui I want to come back”. Great view, well equipped unit. Lovely unit. Looks just like the pics. Walk directly into unit from parking, so no steps. The property manager is a pro and very helpful. There are no clocks. I would add one in the bedroom and a wall clock in the kitchen/living room area. You must remove your shoes inside. I think that should be added to the property description since that is a problem for me due to a physical disability. I understand this is usual for HI tho. We especially loved having 2 bathrooms. Exactly the holiday we wanted and the condo was perfect! Great location and views. Dave, the property manager, was very helpful. Everything you need is in the condo. Very peaceful and quiet. This home over-delivered on every representation. We’ve never rented such a beautiful well stocked home. Just as beautiful and nice as advertised!! Will be coming back!!! Everything went as detailed online. David met us upon arrival and explained everything in detail. The flowers and plants on the balcony were beautiful and well cared for. The condo was very spacious. It was very quiet and relaxing!! Everything was great and Dave was the perfect host. The property was as described and very clean with great furnishings. The weather and view was fantastic and close proximity to beaches, trails, restaurants, shopping and great golf is a plus. We totally enjoyed our stay and would return to this property.